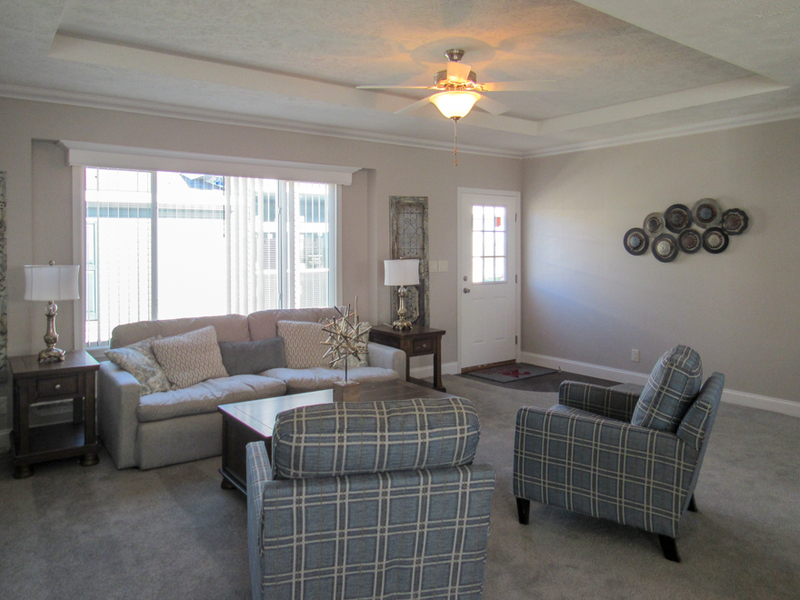 The Piedmont model has 3 Beds and 2 Baths. 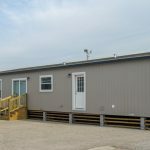 This 1880 square foot Double Wide home is available for delivery in Kansas, Missouri, Oklahoma, Arkansas & Colorado. 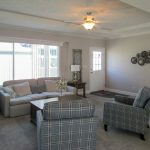 Some families prefer to have both a living room AND a family room. 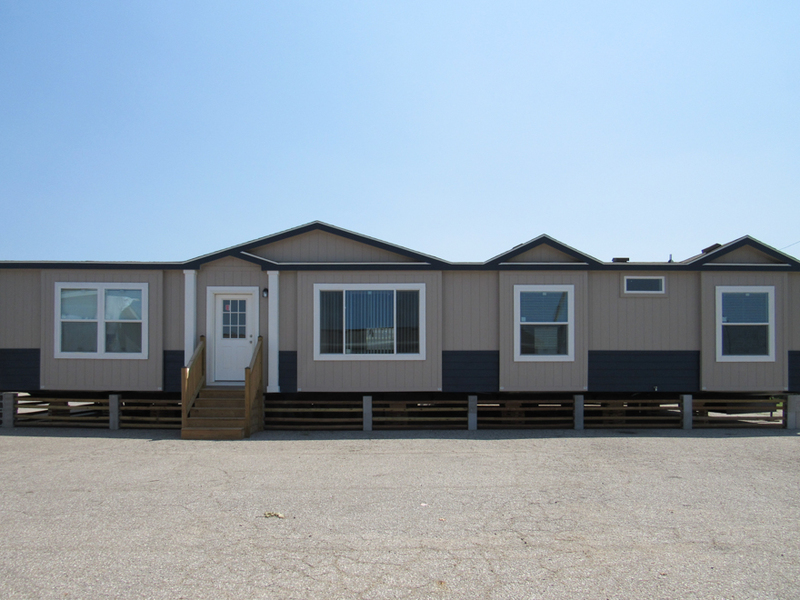 The innovative, space-saving design of the 62-foot long Piedmont model makes that must-have combination possible. 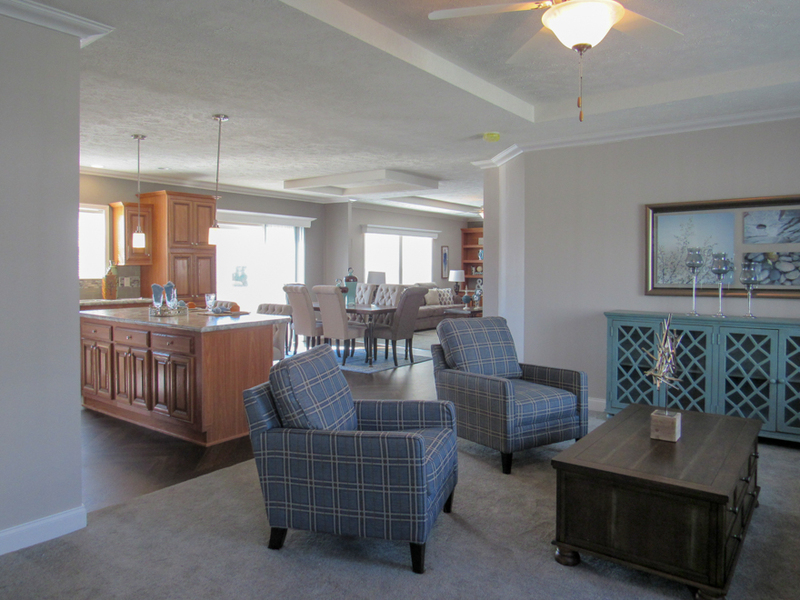 The family room is as inviting as the living room and both provide direct access the kitchen and dining space. 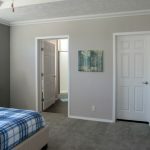 Ask about the optional tray ceiling throughout. Front elevation – 20′ Dormer over living room window. Navy fascia with Pure White trim. Low E white vinyl windows. 9 lite white vinyl door. 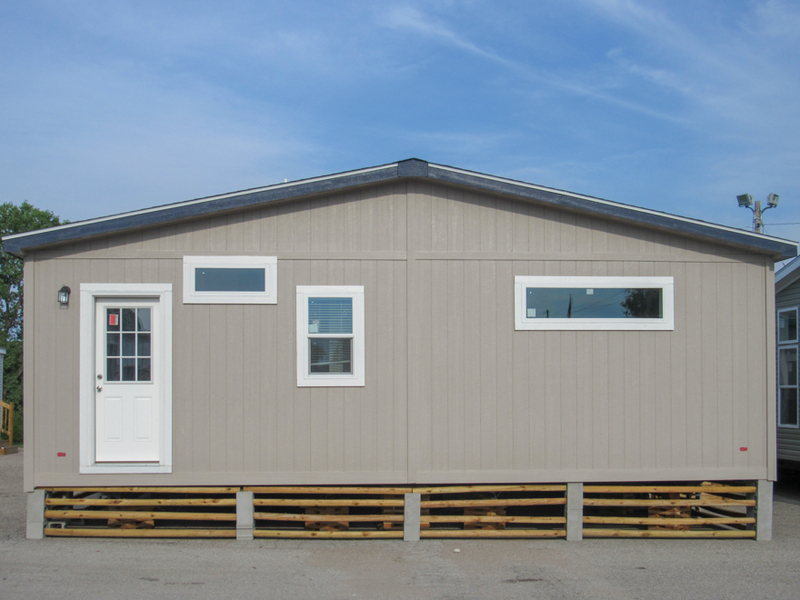 Options shown: Perfect Greige LP panel siding with 5 rows of Navel LP lap panel siding. 2 exterior columns painted Pure White. Box bay windows. 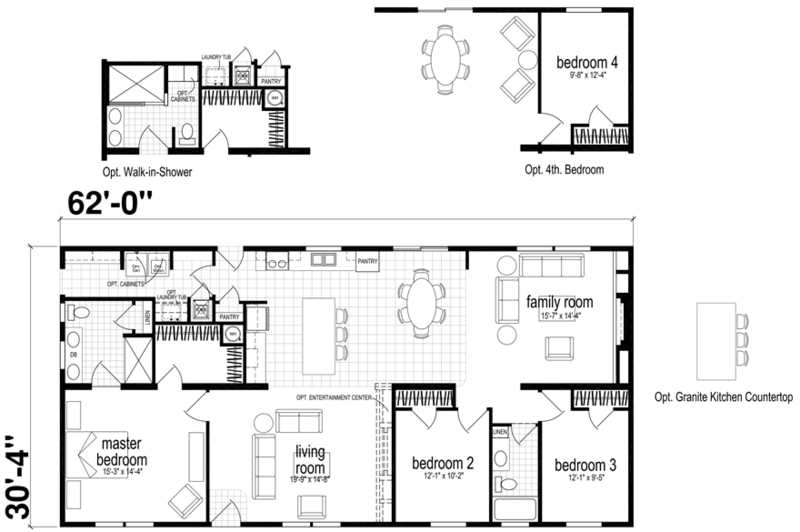 Two 6′ dormers above bedroom windows. Back elevation – Navy fascia with Pure White trim. Low E white vinyl windows. 9 lite white vinyl door. Driftwood standard shingles. 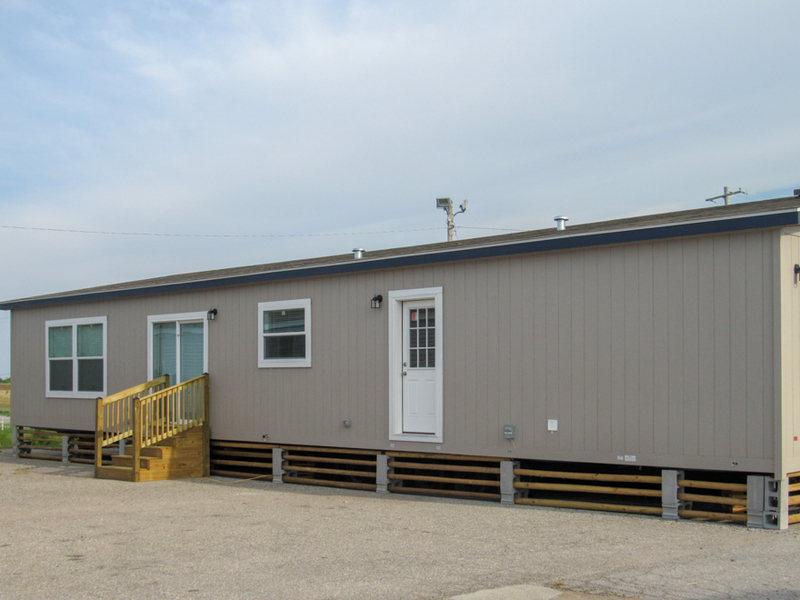 Options shown: Perfect Greige LP panel siding. Non hitch-end elevation- Navy fascia with Pure White trim. Low E white vinyl windows. 9 lite white vinyl door. 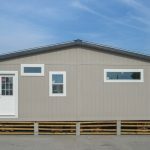 Options shown: Perfect Greige LP panel siding. 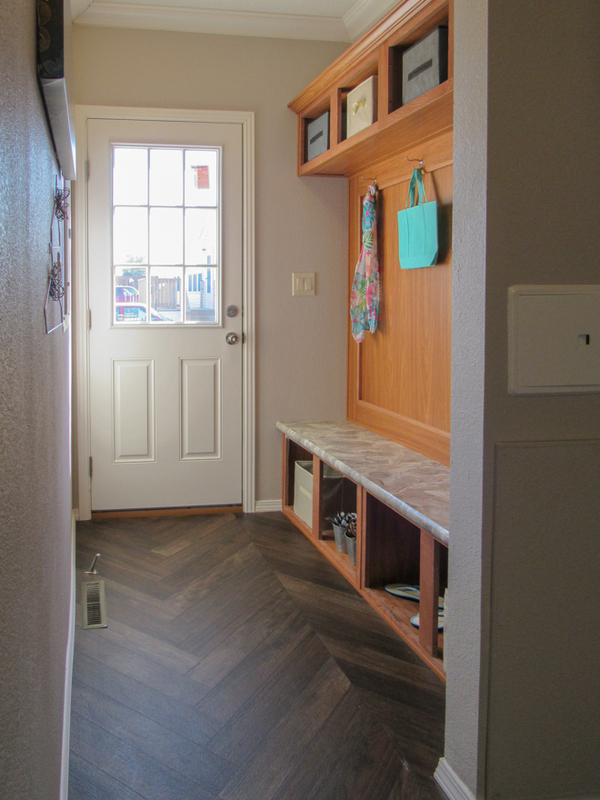 Front door entry – Entryway linoleum flooring is Luxflor Frontier. Macrame durable cut pile carpet in Cloudburst color. Tape and textured walls throughout painted Alpaca. White 5 1/4″ cove molding and5 1/4″ base molding. Low E white vinyl windows with white wood cornice and white wood blinds. White paddle ceiling fan. 9 lite white vinyl door with white door casings. Options shown: Tray ceiling in living room. Box bay window with Formica Cipollino Bianco window sill. 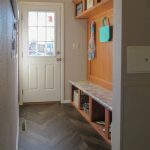 Front door entry – Linoleum flooring is Luxflor Frontier. Macrame durable cut pile carpet in Cloudburst color. Tape and textured walls throughout painted Alpaca. White 5 1/4″ cove molding and 5 1/4″ base molding. 9 lite white vinyl door. 6 panel white vinyl door to Master bedroom. Options shown: Tray ceiling in living room. Master bedroom accent wall painted Dovetail. 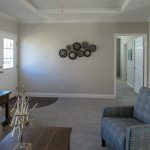 Living room to dining – Macrame durable cut pile carpet in Cloudburst color. Linoleum flooring is Luxflor Frontier. Tape and textured walls throughout painted Alpaca. White 5 1/4″ cove molding and 5 1/4″ base molding. Low E white vinyl windows with white wood cornice and white wood blinds. Marrakesh Oak raised panel cabinets in kitchen. 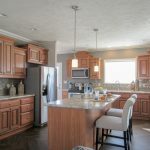 Pendant lighting over island with can lighting throughout kitchen. Options shown: Tray ceiling in living room. 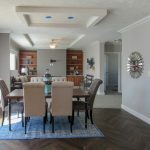 Coffered ceiling in dining area. Kitchen, dining and family room accent wall painted Dovetail. Sliding glass door in dining area. Formica Cipollino Bianco countertops throughout. 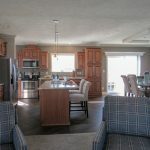 Kitchen and dining area – Linoleum flooring is Luxflor Frontier. Marrakesh Oak raised panel cabinets. Cresent edging on countertops throughout. 18″ Silver Mink subway tile back splash with Triton tile center accent. Tape and textured walls throughout painted Alpaca. White 5 1/4″ cove molding and 5 1/4″ base molding. Low E white vinyl windows with white wood cornice and white wood blinds. 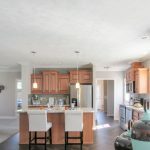 Pendant lighting over island with can lighting throughout kitchen. 30″ Deluxe electric range. 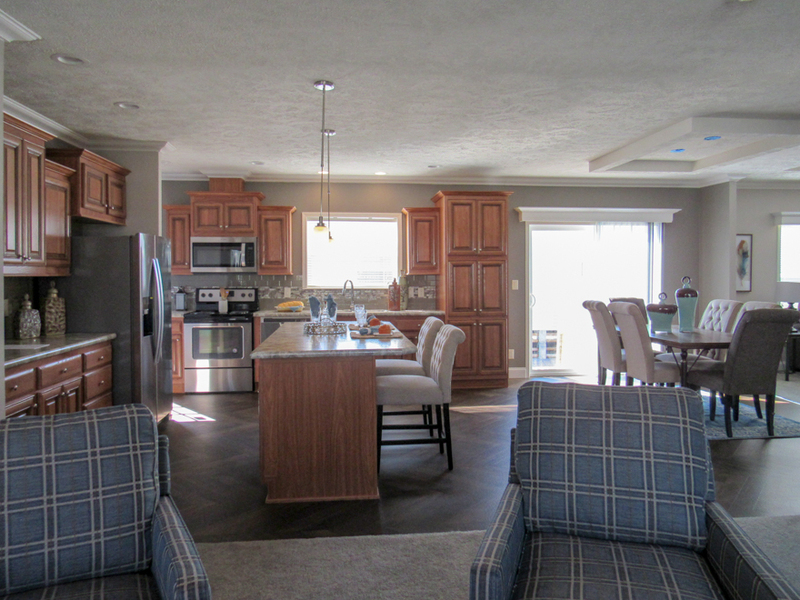 Options shown: Kitchen, dining and family room accent wall painted Dovetail. 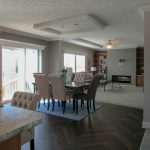 Coffered ceiling in dining area. Sliding glass door in dining area with blinds. Formica Cipollino Bianco countertops throughout. Stainless steel applicance package includes dishwasher and microwave/rangehood. 21 cu ft Stainless steel refrigerator with dispenser. Single level pull down faucet on kitchen sink. Kitchen – Linoleum flooring is Luxflor Frontier. Marrakesh Oak raised panel cabinets in kitchen. Cresent edging on countertops throughout. 18″ Silver Mink subway tile back splash with Triton tile center accent. Macrame durable cut pile carpet in Cloudburst color. Tape and textured walls throughout painted Alpaca. White 5 1/4″ cove molding and 5 1/4″ base molding. Low E white vinyl windows with White wood blinds. 9 lite white vinyl rear door. Pendant lighting over island with can lighting throughout kitchen. 30″ Deluxe electric range. Options shown: Kitchen accent wall painted Dovetail. Formica Cipollino Bianco countertops throughout. Stainless steel applicance package includes dishwasher and microwave/rangehood. 21 cu ft Stainless steel refrigerator with dispenser. Single level pull down faucet on kitchen sink. Kitchen – Linoleum flooring is Luxflor Frontier. Macrame durable cut pile carpet in Cloudburst color. Marrakesh raised panel cabinets in kitchen. Cresent edging on countertops throughout. 18″ Silver Mink subway tile back splash with Triton tile center accent. Tape and textured walls throughout painted Alpaca. White 5 1/4″ cove molding and 5 1/4″ base molding. 9 lite white vinyl rear door. Pendant lighting over island with can lighting throughout kitchen. 30″ Deluxe electric range. Options shown: Kitchen accent wall painted Dovetail. Formica Cipollino Bianco countertops throughout. Stainless steel applicance package includes dishwasher and microwave/rangehood. 21 cu ft Stainless steel refrigerator with dispenser. Single level pull down faucet on kitchen sink. 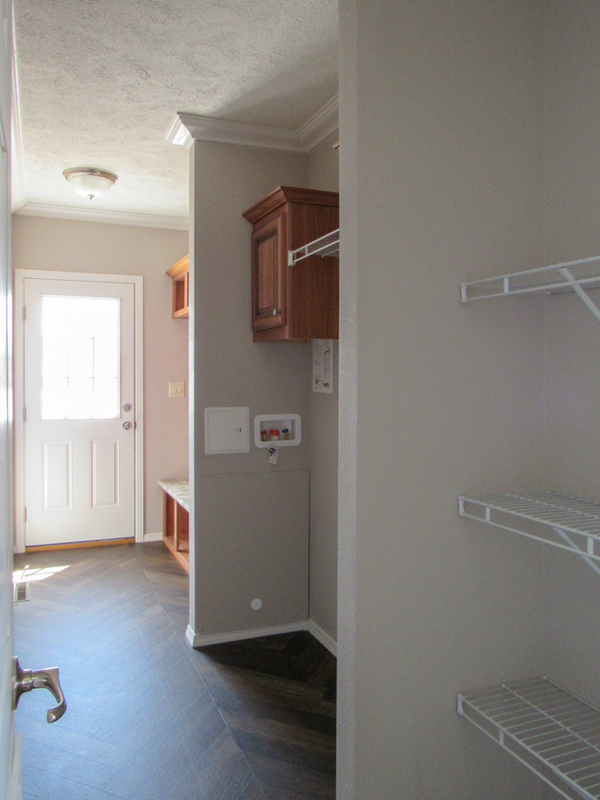 Utility area – Linoleum flooring is Luxflor Frontier. Tape and textured walls throughout painted Alpaca. White 5 1/4″ cove molding and 4″ base molding. Plumbed, wire and vent for washer/dryer. 9 lite white vinyl door. Marrakesh Oak wood coat drop zone. 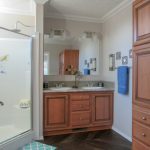 Options shown: Marrakesh Oak raised panel cabinets over washer and dryer area. 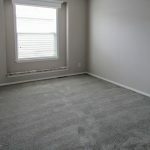 Utility area – Linoleum flooring is Luxflor Frontier. Tape and textured walls throughout painted Alpaca. White 5 1/4″ cove molding and 4″ base molding. Plumbed, wire and vent for washer/dryer. 9 lite white vinyl rear door. Marrakesh Oak wood coat drop zone with Formica Cipollino Bianco seat. 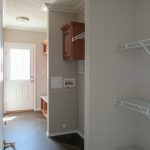 Utility area – Linoleum flooring is Luxflor Frontier. Tape and textured walls throughout painted Alpaca. 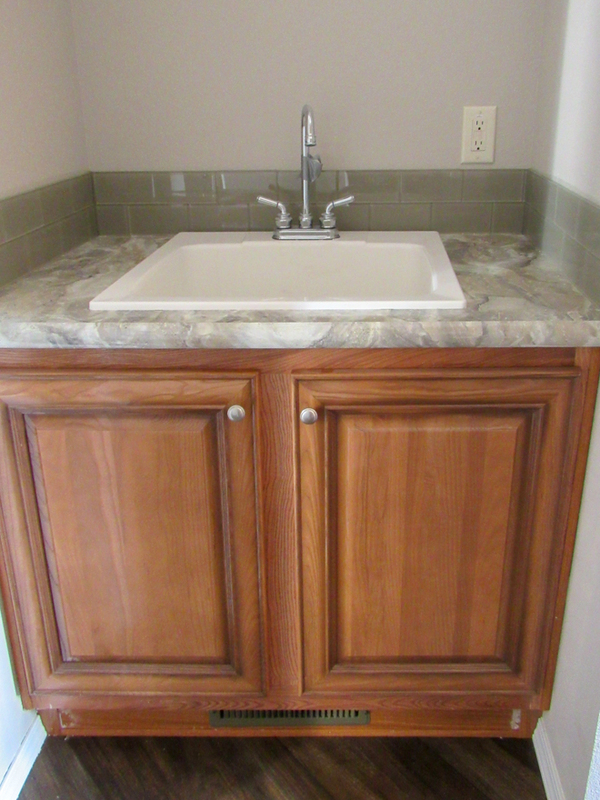 Options shown: Marrakesh Oak raised panel base cabinet and Formica Cipollino Bianco countertop with laundry sink. 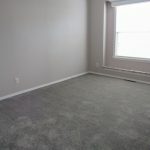 Dining to Family rooms – Linoleum flooring is Luxflor Frontier. Macrame durable cut pile carpet in Cloudburst color. Tape and textured walls throughout painted Alpaca. White 5 1/4″ cove molding and 5 1/4″ base molding. 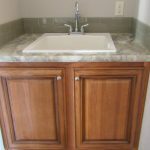 Cresent edging on countertops. Low E white vinyl windows with white wood cornice and white wood blinds. Marrakesh Oak raised panel cabinets in kitchen. White paddle fan. 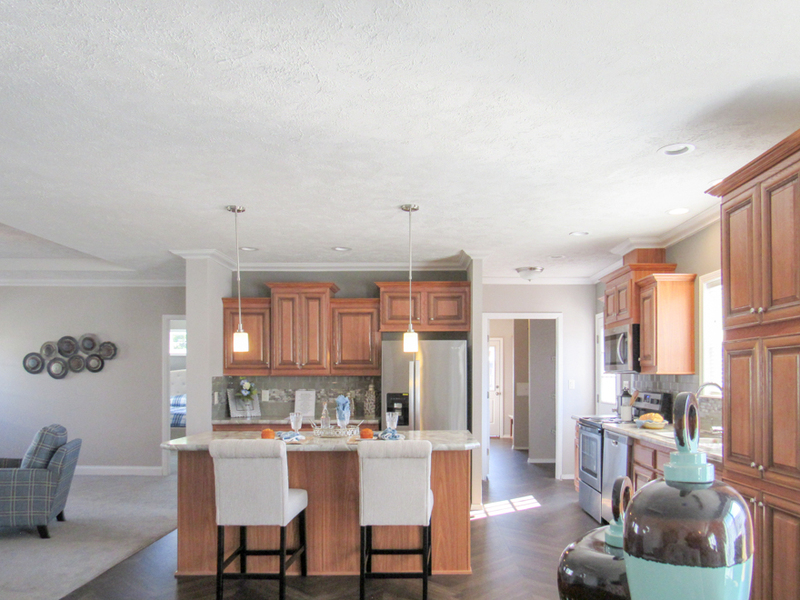 Options shown: Kitchen, dining and family room accent wall painted Dovetail. 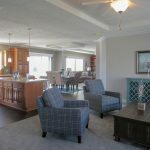 Coffered ceiling in dining area. Sliding glass door in dining area. Formica Cipollino Bianco countertops . Entertainment center with TV mount. 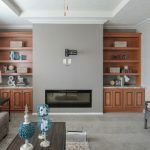 Dimplex 50″ Prism Linear Fireplace. Marrakesh Oak raised panel bookcase with Formica Cipollino Bianco countertop. Tray ceiling in living room. 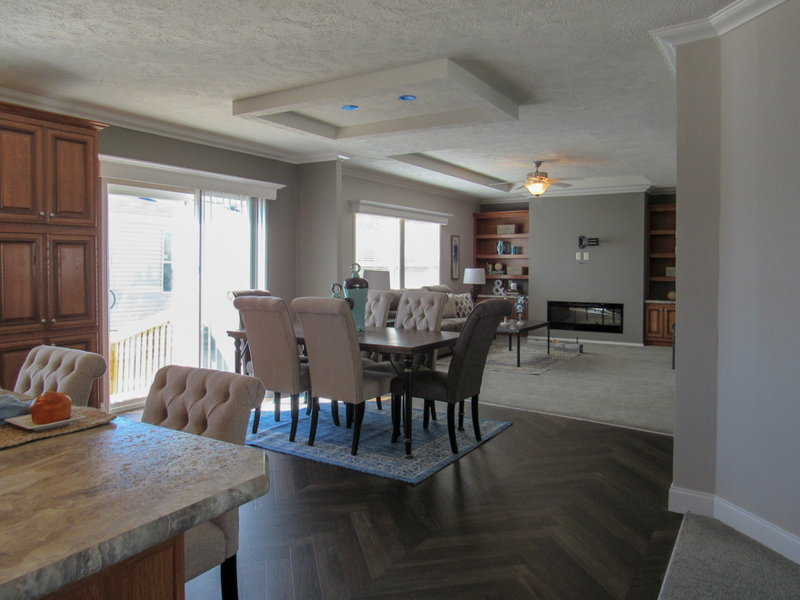 Dining to Family rooms – Linoleum flooring is Luxflor Frontier. Macrame durable cut pile carpet in Cloudburst color. Tape and textured walls throughout painted Alpaca. White 5 1/4″ cove molding and 5 1/4″ base molding. Cresent edging on countertop. White paddle fan. Low E white vinyl windows with White wood cornice and White wood blinds. 6 panel white vinyl door to bedroom. 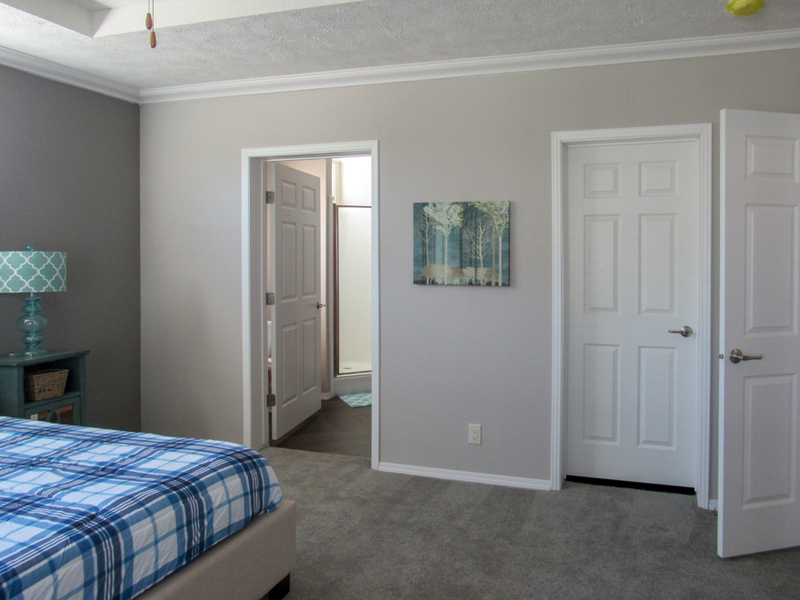 Options shown: Dining and family room accent wall painted Dovetail. 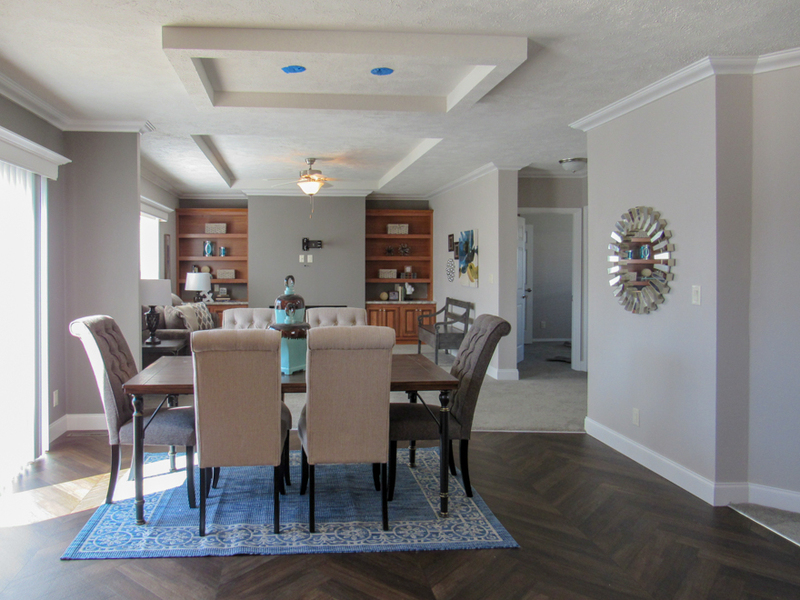 Coffered ceiling in dining area. Tray ceiling in living room. Sliding glass door in dining area. Entertainment center with TV mount. 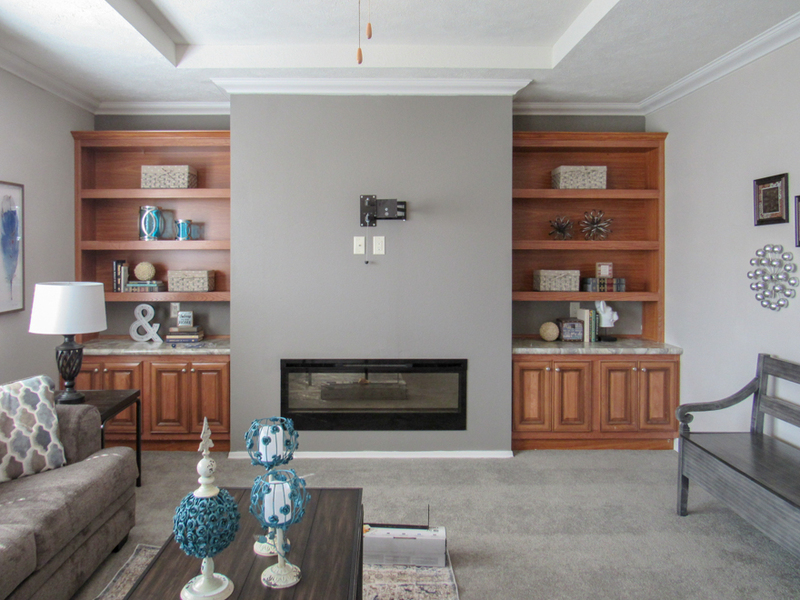 Dimplex 50″ Prism Linear Fireplace with Marrakesh Oak raised panel bookcases and Formica Cipollino Bianco countertops. 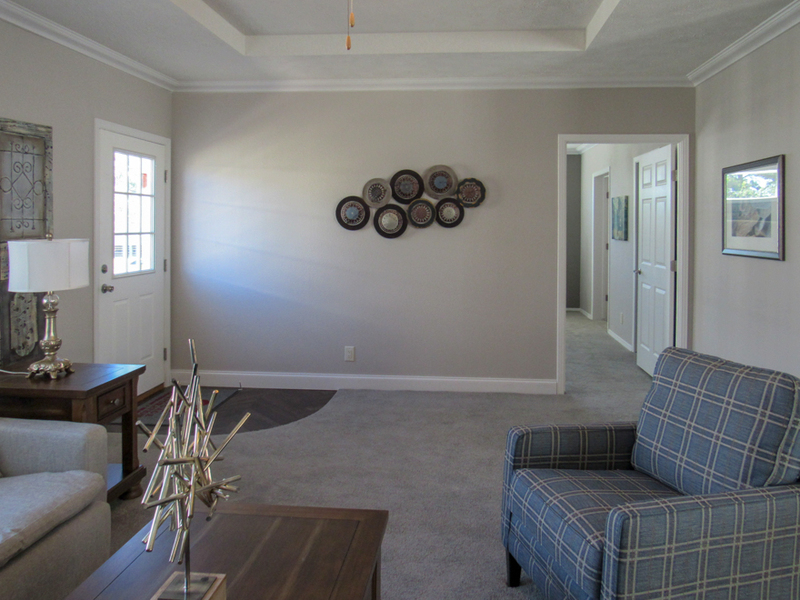 Family room – Tape and textured walls throughout painted Alpaca. White 5 1/4″ cove molding and 4″ base molding. Cresent edging on countertop. Option shown: Entertainment center with TV mount. Dimplex 50″ Prism Linear Fireplace. Marrakesh Oak raised panel bookcases and Formica Cipollino Bianco countertops. Tray ceiling in living room. Accent wall painted Dovetail. 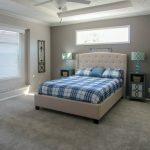 Master bedroom – Macrame durable cut pile carpet in Cloudburst color. Tape and textured walls throughout painted Alpaca. White 5 1/4″ cove molding and 4″ base molding. White paddle fan. Low E white vinyl windows with white wood cornice and white wood blinds. Box bay window with Formica Cipollino Bianco window sill. Transom window on accent wall. Options shown: Tray ceiling. Accent wall painted Dovetail. 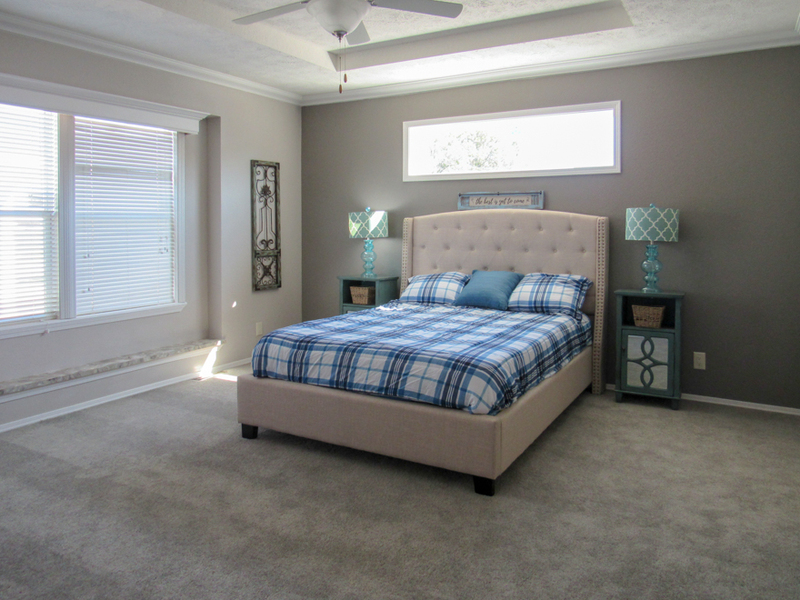 Master bedroom – Macrame durable cut pile carpet in Cloudburst color. Tape and textured walls throughout painted Alpaca. White 5 1/4″ cove molding and 4″ base molding. White paddle fan. Transom window on accent wall. 6 panel white vinyl doors. Options shown: Tray ceiling. Accent wall painted Dovetail. 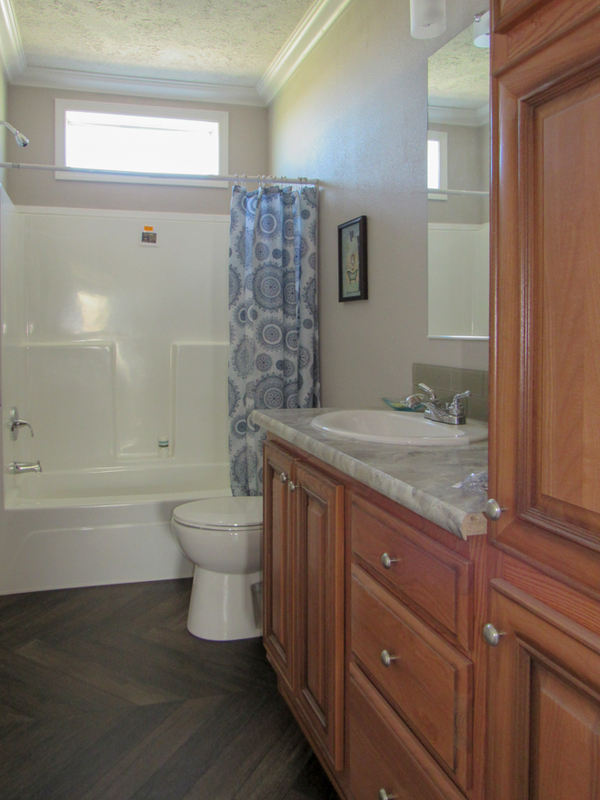 Master Bathroom -Linoleum flooring is Luxflor Frontier. Marrakesh Oak raised panel cabinets. Cresent edging on countertops throughout. 6″ Silver Mink subway tile back splash. Two arm vanity lights over mirror. Tape and textured walls throughout painted Alpaca. White 5 1/4″ cove molding and 4″ base molding. Corner fiberglass shower with can light. 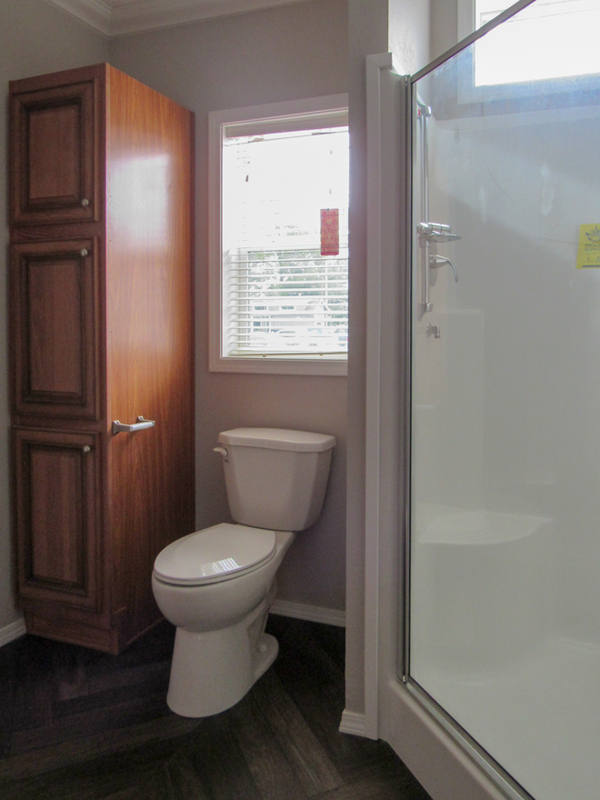 Options shown: Formica Cipollino Bianco countertops throughout. Marrakesh Oak raised panel linen cabinet with drawer banks. 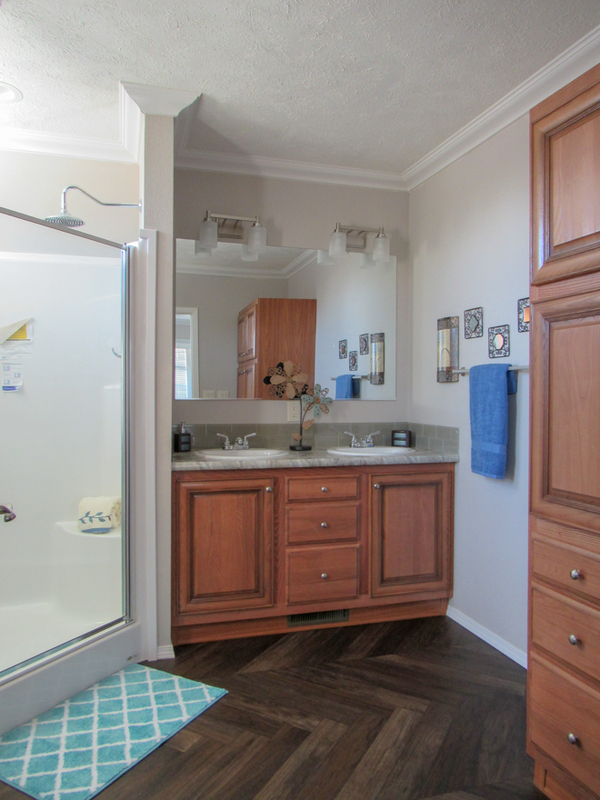 Master Bathroom -Linoleum flooring is Luxflor Frontier. Marrakesh Oak raised panel cabinet. Tape and textured walls throughout painted Alpaca. Corner fiberglass shower. Low E white vinyl windows with white wood blinds. White 5 1/4″ cove molding and 4″ base molding. 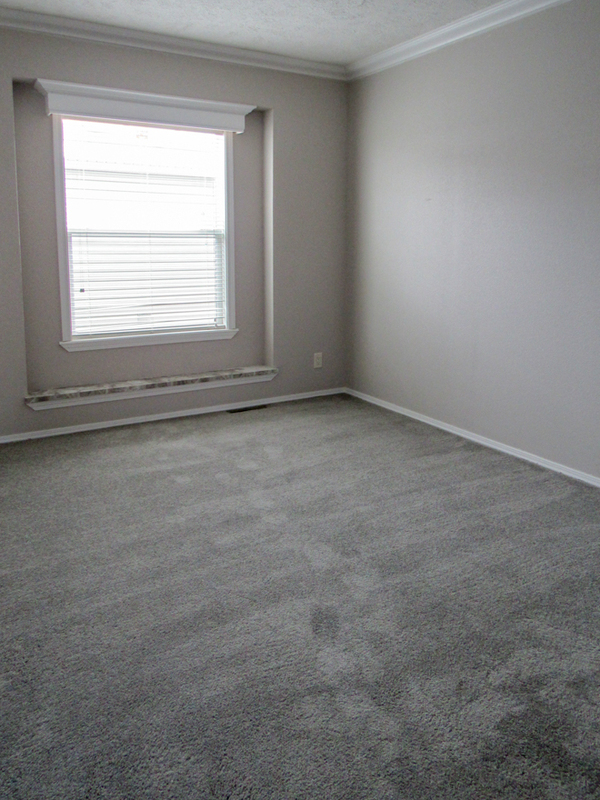 Bedroom – Macrame durable cut pile carpet in Cloudburst color. Tape and textured walls throughout painted Alpaca. White 5 1/4″ cove molding and 4″ base molding. Low E white vinyl windows with white wood cornice and white wood blinds. Options shown: Box bay window with Formica Cipollino Bianco window sill. 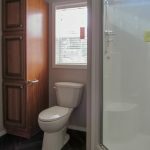 Bathroom – Linoleum flooring is Luxflor Frontier. 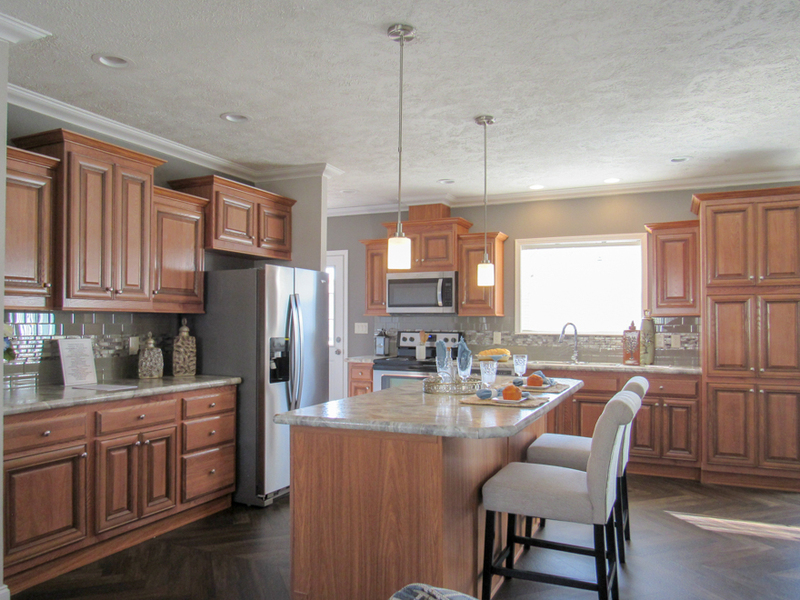 Marrakesh Oak raised panel cabinets. Tape and textured walls throughout painted Alpaca. 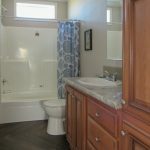 60″ fiberglass tub/shower combo. Low E white vinyl window. Options shown: Formica Cipollino bianco countertop. 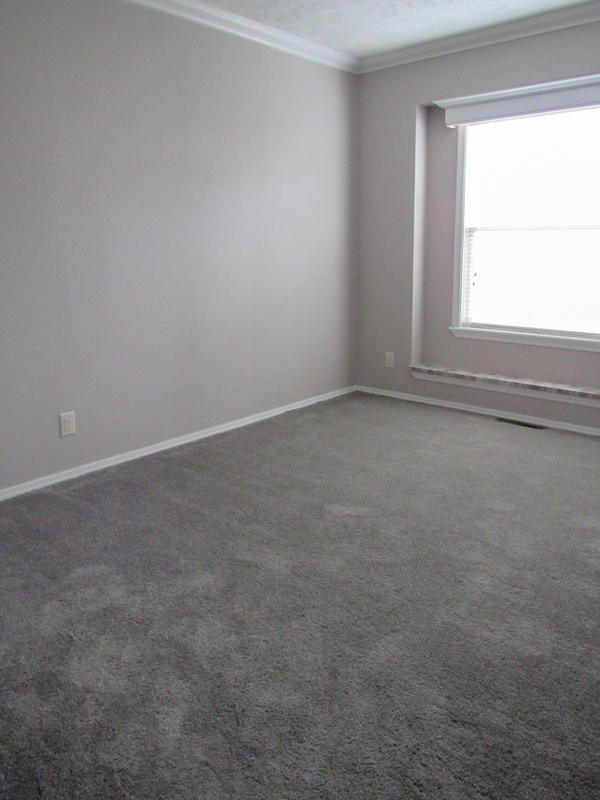 Bedroom – Macramé durable cut pile carpet in Cloudburst color. Tape and textured walls throughout painted Alpaca. White 5 1/4″ cove molding and 4″ base molding. Low E white vinyl windows with white wood cornice and white wood blinds. Options shown: Box bay window with Formica Cipollino Bianco window sill. 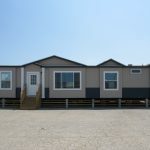 Ask your housing consultant about the other great features that come standard on the Piedmont manufactured home.